Comply™ Professional foam eartips let you continue using your ISOtunes in-ear earphones for longer, enhancing their lifespan and saving money. Simply replacing the ear tips on your earphones from time to time will help keep your ISOtunes in good working order. Never pay for another set of expensive high-quality earphones when a new pair of ear tips can make them like new again - for a fraction of the cost. These ear tips are made of Comply memory foam, which responds to your natural body heat, conforming to perfectly suit the shape of your ear canals. That superb fit makes these foam tips highly effective at blocking noise, as well as extremely comfortable to wear. These are replacement tips for the Original ISOtunes only. We also offer replacement tips that fit both the ISOtunes PRO Earphones (IT-01/IT-03) and ISOtunes Wired Earphones (IT-04). Check them out here: PRO Foam Replacement Tips. The eartips on ISOtunes earphones are critically important for defending your ears. They are responsible for keeping noise out, so that these earphones can provide their full noise reduction rating (NRR). If your ear tips aren't in good shape, your ISOtunes cannot provide their full noise blocking capabilities - which means they can no longer be safely relied upon to protect your hearing. So, eartips must be replaced whenever they get old and stop properly expanding back into their full original shape. Remember: worn out ear tips put your hearing at risk. Ear tips can also have a surprisingly big influence on how good your earphones sound. When your ear tips are in good condition and external noise is properly sealed out, you can enjoy the purest, clearest, most faithful sound your earbuds can produce, free from outside interference. 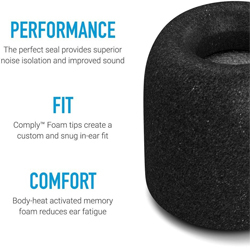 Comply™ foam is particularly well-suited to providing noise isolation, making these ear tips some of the very best you can get.